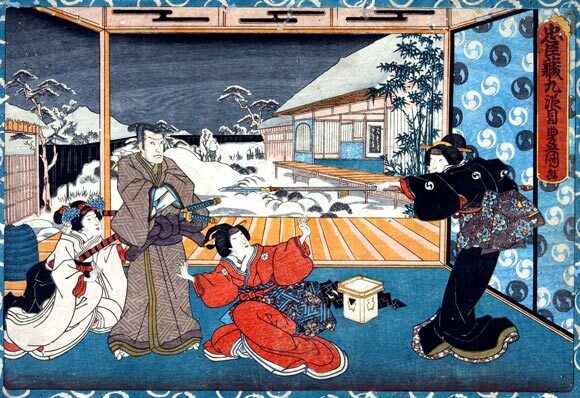 The play "Kanadehon Chûshingura" was originally written for the puppet theater (Bunraku) and staged for the first time in the 8th lunar month of 1748 in Ôsaka at the Takemotoza. It was adapted for Kabuki the same year and staged for the first time in the 12th lunar month of 1748 in Ôsaka at the Kado no Shibai [casting]. The "Yamashina Kankyo" act was performed with the actors Arashi Sanjûrô II, Kataoka Nizaemon IV, Arashi Sangorô II, Yamashita Rokusaburô and Yoshizawa Sakinosuke II in the roles of Yuranosuke, Kakogawa Honzô, Rikiya, Konami and Oishi. The "Yamashina Kankyo" act, the ninth act of "Kanadehon Chûshingura", commonly called "Kudanme" (literally "the ninth one"), is usually staged independently of the others acts of the play. It is rarely included in a tôshi kyôgen production. Previous act: "Michiyuki Tabiji no Yomeiri"
Ôboshi Yuranosuke, the chief retainer of late En'ya Hangan, is living in seeming semi-retirement (kankyo) in Yamashina. He is actually the leader of the vendetta conspiracy, which is being carried secretly. He is pretending to be leading a life of debauchery at the Gion pleasure quarters in nearby Kyôto. Two unexpected visitors, Tonase and Konami, arrive at the residence of Yuranosuke. Konami is the daughter of Kakogawa Honzô, who is the chief retainer of Lord Momonoi Wakasanosuke, and she is the fiancee of Ôboshi Rikiya, who is the son of Yuranosuke. Tonase is her step-mother. Tonase has taken Konami here in order to get her married with Rikiya. Yuranosuke's wife Oishi doesn't welcome them warmly, treating them with a distant ceremony. She recommends them to go to see the sights of Kyôto, because both her husband and son are out. It is a polite way to kick them out. Tonase is very much surprised and gets angry with Oishi, but she asks Oishi to be allowed to meet Yuranosuke to arrange for the wedding ceremony of Konami and Rikiya. Oishi says there is no balance in such a marriage. Tonase, thinking that this answer is related to the fact that Yuranosuke has become a poor rônin, says that this financial problem is not a big deal. Oishi explains that they have changed their mind regarding this marriage because of Honzô's actions, who stopped En'ya Hangan when he tried to strike Kô no Moronô. As a result, En'ya Hangan had to kill himself and the villain Kô no Moronô wasn't killed. Just before the incident happened, Honzô bribed Kô no Moronô but Yuranosuke didn't. Then Kô no Moronô got antipathy for En'ya Hangan. Oishi thinks that Honzô's actions were the cause of the incident. Therefore, Konami isn't a suitable bride to her son Rikiya. Oishi gets out from the room and two women are left with their sadness. Tonase recommends Konami to get married with another man, because she is beautiful enough. She says if Konami wanted to get married, every younger richer man would want her, except Rikiya. But Konami has been seriously disappointed. Konami asks Tonase to kill her unless she becomes the bride of Rikiya. Tonase feels responsible for Konami's marriage more than she needs, because she is only Konami's step-mother. Tonase decides also to kill herself after the killing of Konami. When Tonase is about to kill Konami with the treasure sword of the Kakogawa clan, the plaintive melody of a bamboo shakuhachi flute is heard outside. The player is a travelling komusô priest. Such a sound means that he wants to get some money or food. Then Oishi's voice is heard ordering to stop. Tonase thinks Oishi stopped the priest playing shakuhachi, and she tries to kill Konami again. Oishi herself comes to the room, and she says she has changed her mind. Tonase has managed to save Konami's life. Oishi says she will permit Konami's marriage with Rikiya on one condition. The condition is the severed head of Honzô presented in lieu of a dowry. Tonase and Konami are shocked because it means that the marriage cannot be considered so long as Honzô lives. A voice in the garden says that Honzô's head is here. Then the priest suddenly comes into the room. He is in fact none other than Honzô who disguised himself into a priest. Just after Tonase and Konami departed, Honzô resigned his job and came to Kyôto to secretly observe Yuranosuke. He noticed that Yuranosuke was leading a life of debauchery at the Gion pleasure quarters. He tells Oishi that Yuranosuke has lost his pride as a warrior, because he doesn't intend to do the vendetta of his former lord. Oishi gets angry with Honzô and grabs a spear to attack him. But she isn't strong enough to fight against him. As soon as Honzô kicks Oishi, Rikiya runs into the room and stabs Honzô with Oishi's spear. He is about to give the finishing stroke when Yuranosuke suddenly appears on stage and stops him. Both father and son were in fact at home, watching and hearing everything. Yuranosuke gives medical treatment to Honzô, and asks if he has been satisfied. Yuranosuke has known that Honzô wanted Rikiya to kill him. Honzô begins to tell the whole story When Honzô observed Yuranosuke at the Gion pleasure quarters, he realized that Yuranosuke was in fact pretending to spend a debauchery life to secretly carry on the vendetta plan. Honzô has felt that he was responsible for the death of En'ya Hangan. He thought he should die and that he would rather be killed by Rikiya than by anybody else. Honzô has another thing to help them. It is a secret map of the interior of Kô no Moronô's mansion in Edo. It will help them to break into the mansion and seek out their enemy. Honzô presents the map as the dowry of his daughter Konami. Oishi refused Konami as a bride of Rikiya, because she didn't want Konami to be a widow. Honzô also knew it. The overjoyed Yuranosuke gets the map and tells Honzô how they will attack the mansion of Kô no Moronô. There is a technical explanation about the ingenious way discovered by Rikiya to silently force the shutters of the mansion's veranda with the help of bamboos. Rikiya will remind behind for a day, in order to set everything in order and spend his bridal night with Konami before joining the vendetta group. The dying Honzô is full of gratitude for Yuranosuke, who gathers Honzô's disguise and wears the komusô robe as his own disguise. The time has come and Yuranosuke departs, without a backward glance for his wife Oishi. Next act: "Amakawaya Gihei Uchi"